Does the history of the U.S. West look any different when men are not consistently the principal actors, decision makers, and heroes? As this engaging first volume in our new Western History Series illustrates, the familiar scene changes dramatically. By putting women at the center of the story, from before first contact to the end of World War II, and looking at the historical narrative from women’s points of view, this unique new book gracefully shows that women of all races, ethnicities, classes, and religions—workers and explorers, mothers and adventurers, miners and ranchers, activists and environmentalists, housewives and community organizers—were active participants in every facet of the history of the West. Indeed, the choices women made and the actions they took helped shape the way that history was made. With clearly defined themes woven throughout an engaging narrative-driven text—as well as maps and three banks of stunning photographs, Choices and Chances, this innovative and important new work is certain to give college-level students and readers of all levels alike a new appreciation of and perspectives in western history, making it ideal supplementary reading for courses in the history of the U.S. West as well as survey courses in United States and Women’s history. Brief Description Survey of history of the American West, intended for undergraduate regional history courses. Explores womens' history in the American West, an ideal supplement for courses in American West, women's history, or US Survey. Explores African-American experience in the American West, an ideal supplement for courses in American West, African-American History, or US Survey. 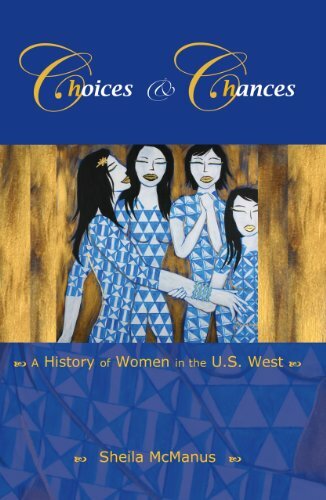 Sheila McManus is the author of Choices and Chances: A History of Women in the U.S. West, published by Wiley.